History of the area in which you live - Times Publishing Newspapers, Inc.
Now only a rapid, the Falls of the Delaware, or Sankikan as the Native Americans called it, was once the landmark met by settlers traveling along what was then called the South River in the 17th century. The first of these settlers were the Dutch, who set up trading posts beginning in 1616. By 1640 the Swedes made the county’s first recorded land purchase from the Lenni Lenape Indians around the area of Sankikan. Soon after, the Dutch and Swedish joint occupancy dissolved with the migration of dozens of English Quakers, who set up the Crewcorne village at present day Morrisville in 1679. Named after the market town and parish of Crewkerne, in Somersetshire, England, the “ye new seated towne” established the county’s first court. In 1683, Crewcorne’s hanging site at Tyburn carried out the county’s first execution. The town below the falls eventually disappeared. In 1686, the Provincial Council ordered that an existing Native American trail be transformed into King’s Highway (Route 13) through Bristol, Falls and Morrisville. When the county’s first townships were established in 1692, the name of Falls was left blank on maps until a more appropriate was considered. In 1682, King Charles II granted Bucks County founder William Penn 8,431 acres of land north of Philadelphia in payment of debt owed to his father. It was along the Delaware in present-day Falls where Penn established his home – Pennsbury. As time passed, Penn distributed the land to other Quakers who migrated from England. These settlers began worshipping each month at the home of William Biles, recording minutes that would constitute the first family records in Bucks. Built three miles from Pennsbury Manor, or the “Palace Capital,” Fallsington was created when Samuel Burgess donated six acres of land in 1690 to create the first meetinghouse at the current day Meeting House Square. This would form the nucleus of Fallsington, which would later spawn a blacksmith, butcher, carpenter, carriage builder, cooper, insurance agent, machinists, surveyor, wheelwright, physicians and farmers by 1860. 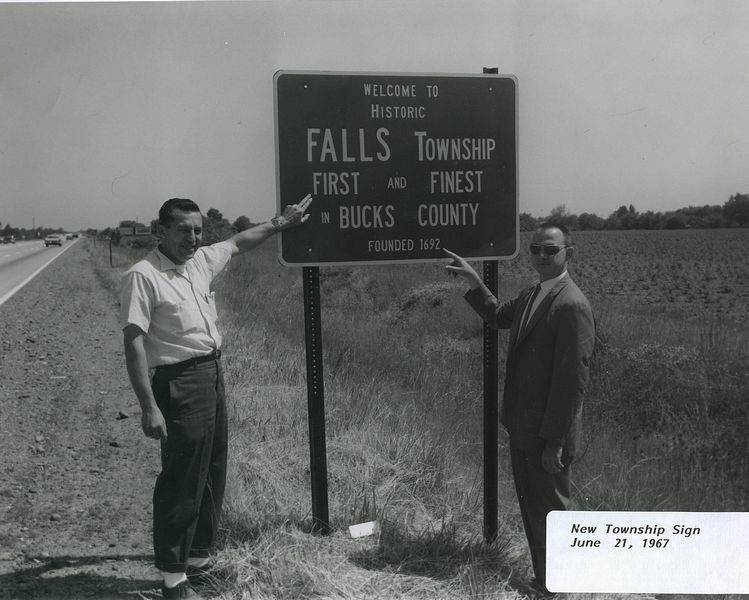 It was the township’s largest village until the construction of Fairless Hills and Levittown. Other villages included Oxford Valley, named after an ox on a tavern sign and a ford over a creek that existed before 1773. While Fallsington became a center of commerce, the Manor fell into despair with the last original building destroyed in 1864. The site was purchased by Pennsylvania in 1932 and resurrected to its current state at the 43-acre site. Built following completion of U.S. Steel’s Fairless Works Plant, the Fairless Hills and Levittown communities transformed Lower Bucks in the early 1950s. Named for U.S. Steel President Benjamin Fairless, the plant along the Delaware employed 8,000 workers at its height in the 1970s. To accommodate the new workers, developer Danherst Corp. began building pre-fabricated homes on a 1.9-square mile section of the township in 1951. During construction Danherst set its headquarters at the historic Three Arches building, which sat on a 287-acre property that now encompasses what is now Fairless Hills. Between 1952 and 1958, Levitt built 17,300 homes of six different models in Bristol, Falls and Middletown townships and Tullytown Borough. The homes were constructed in 41 sections, each assigned a general name with street names beginning with the first letter of the section. Other amenities included Levittown Shopping Center, places of worship, elementary schools, baseball fields, neighborhood parks and five community swimming pools.